Over the winter holidays we received a gigantic box of craft and cooking supplies from the lovely people at Green Works. The box was filled with things that were meant to inspire messy play…that we could easily clean up with the eco-friendly, family-friendly Green Works cleaning products. I love this idea and I knew we were going to have a lot of fun. What I did not realize was what this box of “things” was going to teach me about my tween. From the day our children are born they enter a “stage”. They are newborns…they wear newborn clothing, they sleep in a newborn bed, they cuddle with newborn toys. As time passes they progress into other stages; baby, toddler, preschooler, etc. As they skip from one stage to the next we, as parents, support their social, emotional and developmental growth. We pack up the toys and books from the previous stage and bring in shiny new toys and books to help push them along the road to independence. All of this is exactly how it is supposed to be. Until, I suggested that my tween run down and grab something from the Green Works bin that she wanted to play with. I thought for sure she would pick the glitter glue, the wooden hearts, the baking kits and the cookbook. Well, she did. She brought up the glitter, the wooden hearts, a cookie baking kit, the cookbook and the play dough. 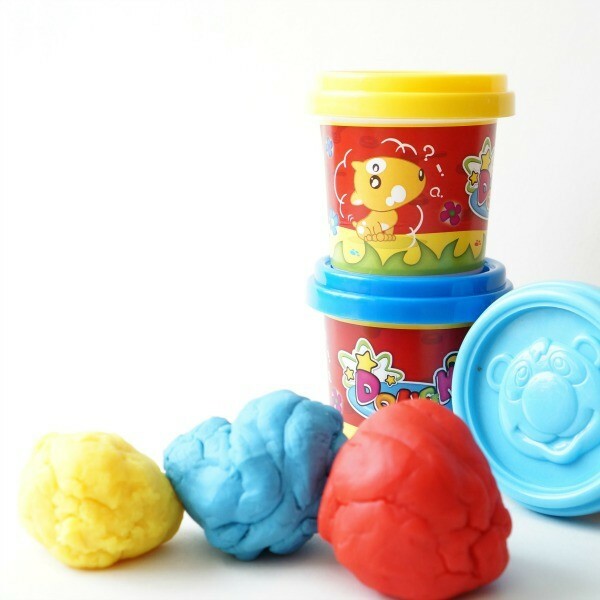 The play dough. That one I didn’t see coming. 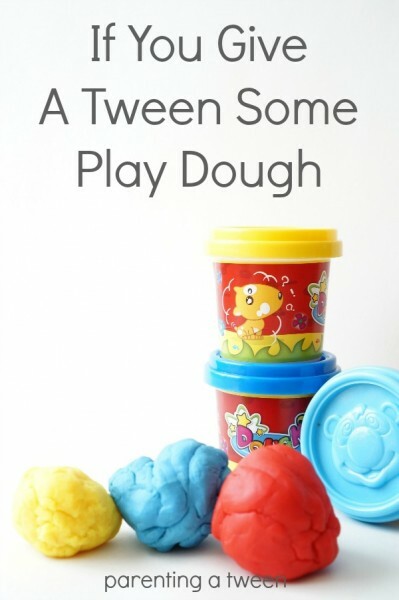 Play dough, a toy intended for preschoolers, not tweens. What I didn’t think would happen was exactly what did happen. My daughter sat down and played with the play dough all day long. Off and on, she would pick up some dough, chat and play. She didn’t make a major master piece. 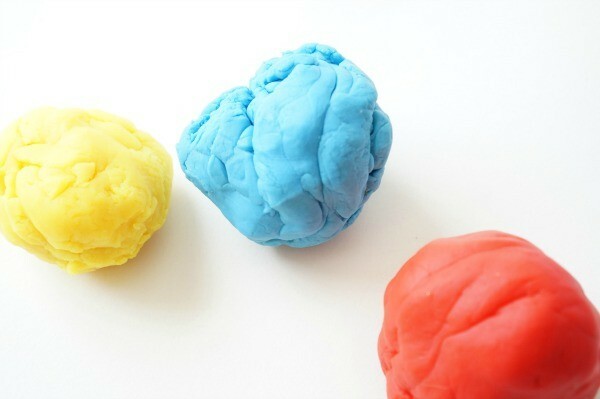 She didn’t create the greatest play dough sculpture ever. Instead she mixed colours (using the colour theory that we had worked through in the past), she made funny little objects that she quickly crushed and she talked with her sister and I.
I found this fascinating. If you give a tween some play dough they will sit and talk. Isn’t that all a parent of a tween wants, to keep the lines of communication open? I have always believed in the power of art therapy. I have always believed in the power of play, imagination and creativity…I write a parenting blog after all. However, I am still amazed when I see what I believe to be true, actually happening before my eyes. It’s like seeing a unicorn. As a parent, I worry if I’m providing my children with enough age-appropriate stimulating activities. We don’t have video games, my tween doesn’t have a cell phone, my daughters don’t have their own tablets, we have strict screen time rules…those are the things tweens are supposed to be doing…the things that children in their developmental stage should be surrounded by. And yet, on that day, my tween chose play dough, sat down, created and chatted all day long. Looking for more articles about what I have learned about the Tweeniverse? Check out our other Tween related articles and be sure to subscribe to have our posts delivered directly to your inbox.